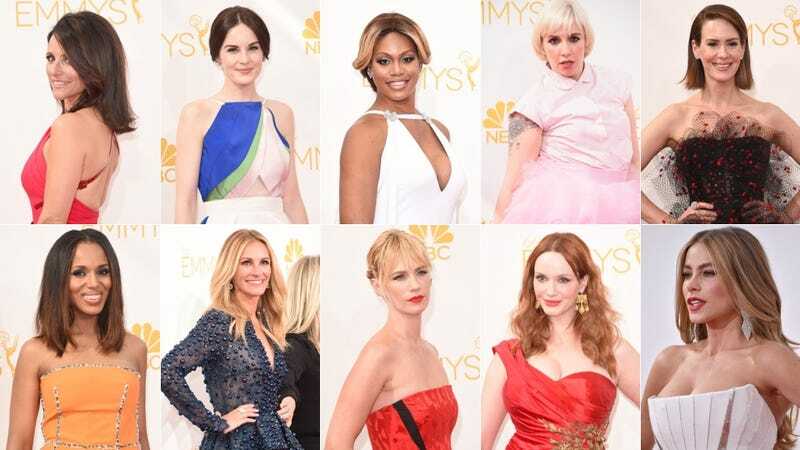 Last night, the 66th annual Emmy Awards took place in Los Angeles. On the red carpet, there were a variety of sartorial approaches: some went minimalistic and understated; some were sequin-encrusted; others wore voluminous gowns. At least one look made me exclaim so loudly in confusion that my pet bunny fell over. Kerry Washington wore an orange silk Prada gown with beaded detailing; it was a daring and interesting choice, and I do think she pulled it off well, but her hair and makeup weren't really helping. January Jones went for a more traditionally glamorous look in a voluminous Prabal Gurung dress, which she saved from being too traditionally glamorous with her edgy shoe choice. Julia Roberts was one of the few women to choose a short dress; here she is in navy Elie Saab with oversize beading. Sofia Vergara wore a structured Roberto Cavalli gown with minimalistic art deco vibes. As per usual, she looked stunning. Here is the lovely Christina Hendricks looking very romantic and regal in a draped Marchesa dress with gold leaf embroidery. She looks excelent in it, but I feel like the gold accessories — earrings especially — are overwhelming. Jessica Paré was relatively understated in a Lanvin LBD with a beaded bodice + a sleek updo. This look is a lil' boring for me — I think she and Christina Hendricks need to swap jewelry amounts. Hayden Panettiere was absolutely radiant in Lorena Sarbu. I am in love with her dress, and her hairstyle is perfect. This is what Galadriel would wear to da club, probably. Laverne Cox wore a formal cape, a garment which has been tragically absent from the red carpet lately. Her dress is Marc Bouwer, and she looks like an ethereal priestess in it. Taylor Schilling also did an art deco-inspired thing in Zuhair Murad. The dress is gorgeous, but of all the things she's wearing, I'm most into the ear cuff. Uzo Aduba was stunning in a frothy, glamorous red strapless gown. She always looks absolutely incredible at awards shows. In more frothy garb worn by Orange Is The New Black cast members: here we have Laura Prepon in an exceptionally ornate emerald and teal dress. She wisely kept it simple on the hair and makeup front. This is a lot of ruffle. More glitter: Amy Poehler looked like a damn goddess in Theia. And Kristen Wiig was all simple and chic in Vera Wang. Julia Louis-Dreyfus looked great in a custom red halter dress by Carolina Herrera; the patent leather straps and belt are v. cool. Sarah Silverman looked extremely elegant in a belted Marni gown with a plunging neckline. She accessorized with a golden vape-holder. Allison Williams also wore Giambattista Valli, but her dress was a lot more understated. This may be one of my favorite looks of the night — it's so elegant without being cloying or overwhelming. Another of my favorite looks: Michelle Dockery in Rosie Assoulin. I love the color scheme and the petal-like bodice. Aaaaaand another favorite: Lizzy Caplan looks divine in Donna Karan Atelier. It's a perfect meeting of classic and modern, and she wears it perfectly. Lena Headey opted for an asymmetrical black dress by Rubin Singer. Natalie Dormer wore a form-fitting color-blocked dress, which I'm not crazy about, but her hair looks very glorious. Sarah Paulson dressed like a goth loofa (in Giorgio Armani). It is definitely a look. Of all the red gowns worn tonight, Claire Danes' Givenchy one is my least favorite. It's black on the runway, which I would have preferred — in color, it feels overwhelming to me with all the lace and the cut-outs the bejeweled neckline. Zooey Deschanel, in fuchsia Oscar de la Renta, was so cheerful. Giggling, wearing an enormous diamond, etc. Melissa McCarthy wore custom black Marchesa like a beautiful enchantress. I really liked Kate Mara in this intricate J. Mendel getup — the contrast between the starkness of the geometric embellishments and the loose layers in the bodice really appeals to me. Sarah Hyland looked incredible in Christian Siriano, and goddess bless her for wearing a formal crop top (never die out, formal crop top trend, please). I would be remiss not to mention how great her brows look. Some of your OITNB favs: Danielle Brooks looked lovely in white with a conceptual lace neckline, and Taryn Manning dazzled in gold. Lea DeLaria had sooo much fun in a simple tuxedo; Adrienne C. Moore kept it relatively simple as well in a glamorous black gown. Some beautiful, bold looks: I love Teyonah Parris' color scheme and her massive skirt; Heidi Klum looked sleek and fresh in Zac Posen; Samira Wiley's bright gown is impeccable, and I love the mermaid skirt on her. In understated gloriousness: Kiernan Shipka in an embellished tea-length skirt by Antonio Berardi; Michelle Monaghan keeping it very simple and chic in Giambattista Valli; Julianna Margulies looking very sultry in Narciso Rodriguez. Prints: Taissa Farmiga mixing an impressionistic print with lace, to interseting effect; Julie Bowen in flowing Peter Som, feat. an amazing neckline; Ariel Winter with the tiniest bit of Red Carpet Midriff. Edie Falco looked stunning in blue; Vanessa Williams slayed in slinky green; Kate Walsh mixed bright yellow with a peplum and a train. In jewel toned ball gowns, we have Allison Tolman in emerald and Mayim Bialik and Keke Palmer in sapphire. More blue: Melissa Rauch in an elegant strapless dress; Anna Gunn in Jenny Packham, Kate Mulgrew looking like the queen of the entire damn universe. Seeing red(ish): Lisa Rinna in a fairly simple number, Game of Thrones' Sibel Kekilli looking very ethereal with her flowing sleeves and gold belt, and Mindy Kaling killing it in Kenzo. More shades of red: Minnie Driver in hot pink with metallic accents; Octavia Spencer swathed in glamor; Kaley Cuoco looking a bit princess-y. Allison Janney wore an incredible velvet dress; Betsy Brandt opted for florals; Cat Deeley chose an ombre Burberry gown. Some gorgeous, simple looks: Alexandra Daddario shimmering in champagne, Padma Lakshmi stunning in a white sheath dress, and Lucy Liu in delicately-draped Zac Posen. Dasha Polanco looked exquisite in a pastel gown; Katherine Heigel wore a bathrobe-lookin' thing, and Downton Abbey's Joanne Froggatt looked almost bridal. Beauteous womyn in white dresses with empire waists: Retta in lace, Angela Basset effusing chicness effortlessly, and Kristen Schaal channeling Marilyn Monroe. Jon Hamm and Jennifer Westfeldt, a very cute couple, were there as well; he wore a tuxedo and she an embellished magenta dress. More couples (or just groups of two, I guess): Seth Meyers and Alexi Ashe, Fred Armisen and Carrie Brownstein, Matthew McConaughey and Camila Alves. Jimmy Kimmel and Molly McNearney, Aaron Paul and Lauren Parsekian, Adam Levine and Behati Prinsloo. Look at him in those stupid sunglasses. Some men! In suits! Here we have Nikolaj Coster-Waldau, Peter Dinklage and Chiwetel Ejiofor. Aaaand Tony Hale, Kevin Spacey and Ashleigh Banfield and Jeff Daniels. Sending you out on a high note — here's Kit Harington trying out a variety of facial expressions.